As one of the first companies to use SDLG’s new L918F compact wheel loader, Patio Town is moving aggregate and mulch, as well as loading and unloading materials from vehicles. For more than 50 years, Patio Town has offered a range of landscaping materials to the Twin Cities area, earning its place in Minnesota as one of the premier providers of outdoor living supplies and services. Throughout its history, the Oakdale-based company has used a wide array of equipment from several different brands. 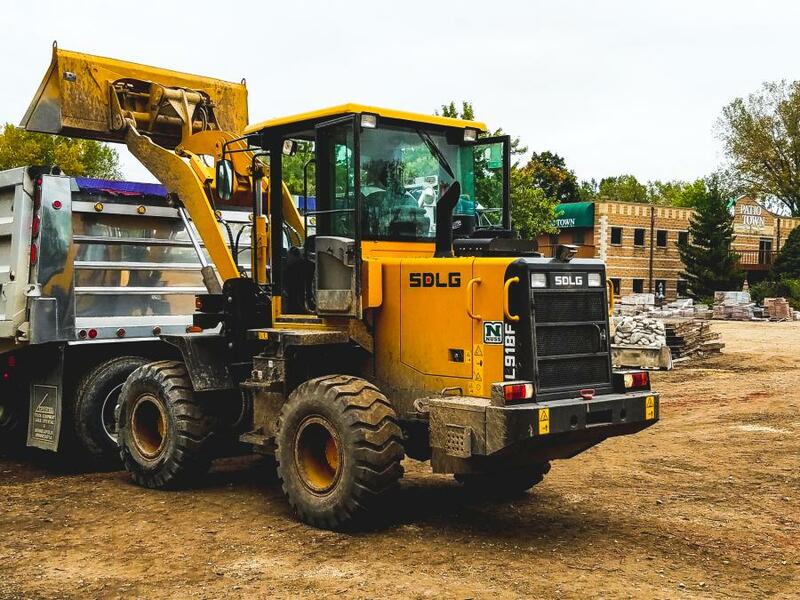 In 2017, though, it chose SDLG as its wheel loader of choice, replacing a premium machine in the process. As one of the first companies to use SDLG's new L918F compact wheel loader, Patio Town is moving aggregate and mulch, as well as loading and unloading materials from vehicles. The company had been using a premium loader for the job, but moved that machine to another facility. Because Patio Town didn't need the features found on a premium machine, it chose an SDLG model as a replacement. The SDLG wheel loader also enabled operators to sit up higher in the cab than the previous loader. Patio Town's operators said the increased visibility was especially beneficial when working in tight quarters, such as parking lots. The L918F compact wheel loader has a 1.0 cu. yd. general purpose bucket mounted to its skid-steer-style coupler, placing it in the compact loader category, but with the versatility of skid-steer-style attachments. The L918F has a rated load of 2.0 tons, a Deutz Tier IV Final certified engine, a skid-steer-style hydraulic quick coupler and full-powered third function hydraulics. A 12-month/2,000-hour warranty with optional extended coverage is also available. The impact of the L918F on Patio Town's operations wouldn't have been possible without service from Nuss Truck & Equipment (Nuss). The two companies share a history, as well as a friendship — Nuss's knowledge of Patio Town's unique needs enabled it to suggest the SDLG wheel loader as an optimal replacement. Nuss Truck & Equipment has eight locations throughout the Midwest, including its headquarters in Rochester, Minn. In addition to SDLG wheel loaders, which the company began offering in 2015, Nuss offers an extensive line of trucks, trailers and other construction equipment. Founded in 1965, Patio Town was the first retail business in the Twin Cities to sell rock, pavers and retaining walls to homeowners. The Oakdale, Minn.-based company has since established itself as the premier retail outlet for landscaping supplies and hard goods. In addition to landscape materials, Patio Town also offers professional installation of pavers, retaining walls and decorative rock.